Cosmic Lifestyle Corp.'s zero-gravity cocktail glass makes use of grooves that could help astronauts enjoy a nice drink during a space tourism experience. While so many space companies are focused on building rockets and spacecraft, could there room for a little style in orbit? This is where Samuel Coniglio said he hopes to fill the gap. The long-time space tourism advocate has created a "zero-gravity" cocktail glass designed to use grooves to keep the liquid in. This would avoid the perennial problem of fluids floating away in orbit, which force astronauts to use straws. "If this doesn't happen, we will just stay with the way we do things," Coniglio told Space.com. "We will organize the company in a matter that will be Earth-bound, commercially oriented, or has some kind of scientific application." Coniglio, the former vice-president (and current board member) of the Space Tourism Society, has been considering the problem of space tourism design since the early 2000s. He has thought about furniture, service robots and many other concepts that could make space travel a bit more luxurious. 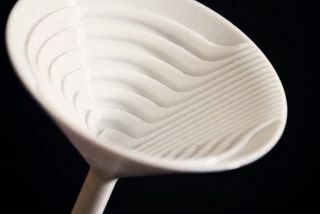 "The cocktail glass was an inspiration piece and fluid dynamic experiment," Coniglio said. "It's an object that people recognize. The public doesn't have to know anything about space, but they get drinks and they get cocktails." Much has changed in the space world in the past 15 years that makes now a good time to fundraise, Coniglio added. There are numerous private companies delivering spacecraft and modules to NASA now, ranging from SpaceX to Orbital Sciences to Bigelow. Meanwhile, Virgin Galactic and XCOR Aerospace are pursuing space. And numerous other private companies are putting forth visions for commercial spaceflight. The glass technology has its roots in rockets. Since liquids tend to stick to the sides of an object in space, some rocket fuel tanks use grooves to keep the propellant moving. And in Coniglio's mind, he said the technology could go even further on Earth — to make showers more efficient, or to reduce water usage in washing machines. Several conceptual glasses have been printed and are awaiting testing. Cosmic Lifestyle plans to begin with drop tests, then book flights with Zero Gravity Corp. that dip and climb to produce brief spans of weightlessness. The big goal is to get a glass — not a cocktail glass, but a more ordinary-looking one — printed onboard the International Space Station, using a Made In Space 3D printer. How quickly this happens all depends on how quickly the funding appears. For now, Coniglio said he is content that the cocktail glass has spurred calls from media outlets and intrigued possible investors. "The original purpose was to get attention," he said. "We want to get people's attention that this project exists, that there's a lot of potential, and we want to encourage the public to get excited about it."